Meet Your Neighbor Nancy Hull from Biggsville. 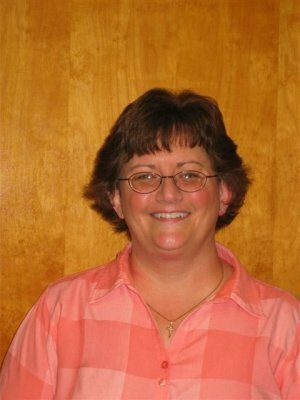 Nancy is employed by West Central School District as a secretary in the high school principal's office. She started full time earlier this year. The teachers, staff, and the kids have welcomed her with open arms and she loves being a part of the school district. She was born in Danville, moved to Missouri when she was age 7, and after 6 years moved to Monmouth in 1971, where she graduated in 1975 from Monmouth High School. She married Eddie Hull and they were married 14 years before Eddie passed away with cancer. Nancy and the girls have lived in Biggsville for the past 24 years. They parented two daughters, Sara, 23, who is a student at Western Illinois University majoring in elementary education with future plans to become a kindergarten teacher, and Amy, 19, a student at Southeastern in West Burlington, Iowa. Her parents are Don and Wilma Sloan of Kirkwood. They will be celebrating their 65th wedding anniversary on August 22 of this year. She has two brothers, Gary (Debbie) who resides in Louisiana, Todd (Joan) who resides in Cleveland, Ohio and one sister, Judy (Chuck) of Ogden. Nancy has one nephew Cary and five nieces, Camie, Heather, Nicole, Tracy and Sherri; She also has several great-nieces and nephews, Amanda, Ashley, Jacob, Jessica, Zack, Max and Christie and several step-nieces and nephews Monica, Piper, Lana, Paul, Alison and Elora. Ed's family is Irmadean and the late Parker Hull, Gloria (Frank), Bill (Sharon) and families. Nancy has been Luminary Chair for the Relay for Life for 11 years. She is a trustee at the Biggsville United Presbyterian Church and has served on the Deacon Board. She also helps organize the "5th Quarter" which involves approximately 15-20 youth who come for pizza after the West Central home football games. She is an avid Cardinal fan. She and the girls enjoy shopping, watching TV, and spending time together. Also she enjoys the time spent with the exclusive Biggsville "Campfire Girls". Nancy loves living in a small community. When they had a fire in 1984 and when Ed passed away in 1996, the support to their family was incredible. Past vacations in Colorado with Ed and his parents, and a vacation to Niagara Falls with Al and Dian Renken and girls are precious memories. Charlotte Shafer and Nancy went to Washington, DC for the Celebration on the Hill sponsored by the American Cancer Society. Luminaries were set up around the Reflection Pool in front of the nation's capitol. A beautiful sight. They plan to attend again in three years. A bit of personal info..Nancy's 50th birthday will be November 4th.